When we think of children eating too much sugary food or drinks, we tend to associate tooth decay and obesity. What most of us don't realise is that sugar has an even worst effect of our children's brain. 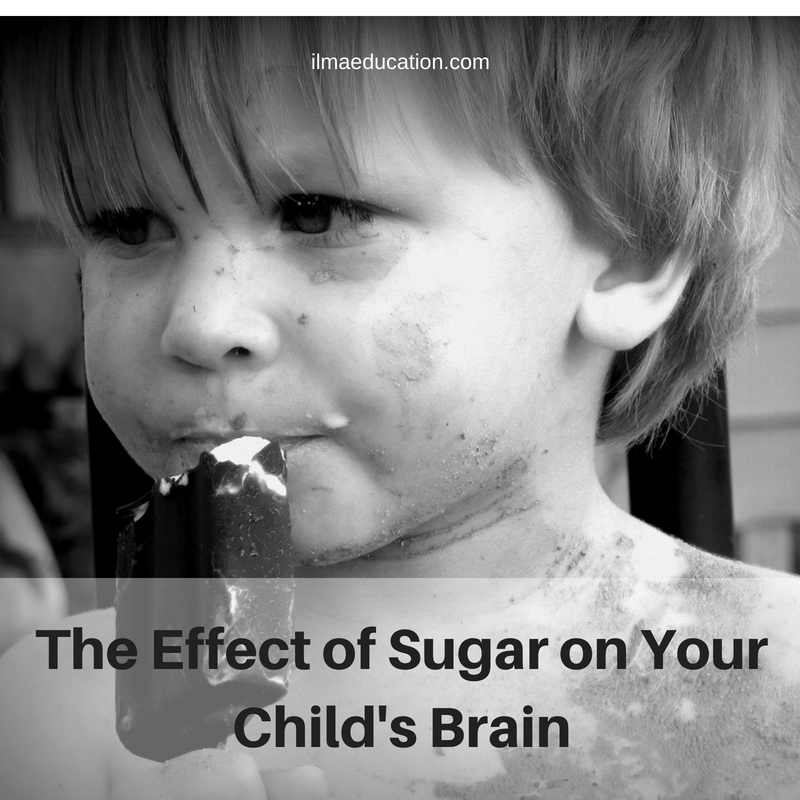 I'll put it simply: too much sugar on the brain affects your child's learning skills and memory. Research on the effects of sugar has shown that a diet high on sugar lowers memory function whereas a low sugar diet increases memory function. When memory is affected so does learning. Most of us have seen YouTube videos of babies first taste of ice cream (if you haven't, you can search it now). While the majority of parents think that it's cute, I inwardly cringe. Not because of the babies' reactions but because of what these parents are training their babies for: a lifetime of cravings for sugary sweets. Most parents just aren't aware of sugar's effect on their child's learning. A lot of children come to my prekindy classes with a lunch packed full of sugary food: doughnuts, chocolate and sweet bars, jellies, lollies, biscuits and even cakes. Most will have a bottle of water but there'll be some with sugary drinks such as fruit flavoured ones which parents think are healthy but which really have a high sugar content. After lunch, there's usually high energy coming from the children which affects their ability to sit still to listen, focus and do some work. There is no clearer example of this effect of sugar than an eleven year old student that I was tutoring. He used to come to me in the mornings to attend my mixed class for homeschoolers. Whenever he came, he just couldn't sit still. He'd be walking around the tables and trying to engage with the other children. Every Friday morning, this child would be dropped off carrying a bottle of soft drink and doughnuts or cakes - and that was just his breakfast. I've sat with his mum and talked to her about changing his diet to less sugary but high in brain nourishing food. This mother had been concerned about her child's learning and when she cut back on the sugars she told me he was much more improved with focusing and concentration. When your child is a baby, try to hold off giving him sugary food for as long as you can. You can feed him naturally sweet food such as fruit. In fact, feed your child as much fruit as you can get him to eat. He will acquire a taste for it and hopefully a preference for it as he grows. Train your child to drink plenty of water instead of flavoured drinks or soft drinks. If you don't have these drinks in your house then your child will have to drink the water. On a weekly basis, you can offer fruit smoothies and herbal tea with honey. If your child is older and you're trying to kick his sugary habit then you can slowly take away one type of food at a time. Firstly, you can stop buying the soft drinks. This means that the whole family stops drinking soft drinks not just your child. When you have weaned him off this them cut out the next sugary thing. Keep doing this until the only thing your child likes to drink is water and the sweet thing he likes to eat is fruit. Once in a while on special occasions you can allow a glass of soft drink or a cake or doughnut. "Once in a while" won't affect your child. It's the daily consumption of sugar that you have to watch out for. To find out more about the brain and brain plasticity, you can read this.